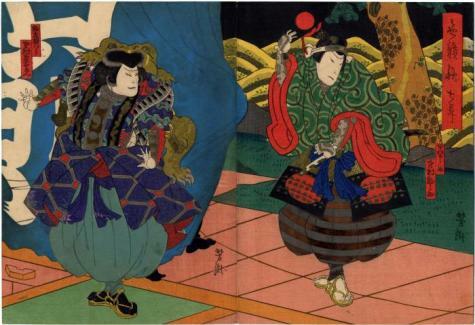 This diptych commemorates a performance of at the Naka Theater in the eighth month of 1867. Illustrated in Ikeda Bunko, Kamigata yakusha-e shūsei (Collected Kamigata Actor Prints), vol. 5, Ikeda Bunko Library, Osaka 2005, no. 270. In 1873 this diptych was reprinted "...with the face and name of the actor on the left changed, made in 1873.2 for the play Keisei Nazuna no Sekku at the Kado Theater." There are other changes too. Click on the second link above from the Museum of Fine Art in Boston for a full view.